Aluminium foot boards - eye catcher that enhances every scooter’s look! Made from high-quality 4mm aluminium channelled sheet, which fits perfectly. 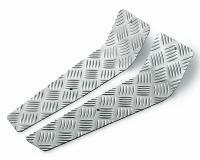 The quintet ribbing on the foot plate provides optimum grip. Is mounted directly to the existing mounting points on the foot well trim using the included stainless steel screws. Suitable for all Peugeot Speedfight I and II Roller.